In my continued efforts to avoid the saturation coverage of the General Election, a request from Sony to test-drive their latest smartphone-capable headphones is nothing if not timely. Combine that with music and downloads (and even FM radio) on a smart new Sony Walkman® High-Resolution Audio player (the NWZ-A15) and my aural isolation - and listening comfort - is complete. 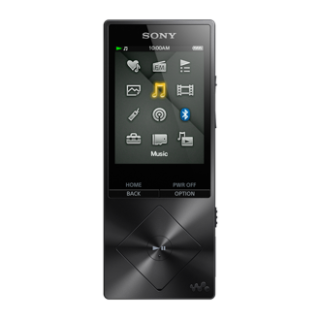 For a start, with up to 30 hours of playtime the Walkman® High-Resolution Audio player isn't likely to leave the listener stranded without anything to listen to but election coverage. Second, combining it with the amazing MDR-1A headphones means not only comfort (they're billed as among the 'most comfortable' headphones on the market - a claim I'd certainly endorse) but quite stunningly authentic audio reproduction, delicately balanced and with a purity I've never before found in a pair of headphones, thanks to what Sony describes as High-Resolution audio - a collection of digital processes allowing the encoding and playback of music using higher sampling rates than those used in CDs. I first tried these out while on holiday over Easter - staying in a caravan with my wife, her mother and our two children. It was a large, generously-proportioned caravan - spacious, comfortable and modern. But still, it was a caravan. With small children. And my mother-in-law. I thought that'd be about as good as it gets in terms of testing both the quality, fidelity and noise-insulating properties of the headphones/walkman combo - and I was right. I downloaded music, transferred some albums (the NWZ-A15 supports LDAC high resolution codec downloads with a Mac) and even uploaded a few audio books - more than enough for the times when I needed to retreat into my own space but didn't have the (physical) space to do so. Unfortunately, the amazing aural quality of the Hi-Res audio downloads through the Hi-Res headphones was so good that my isolation was occasionally too complete to meet with the approval of the rest of the family. There are only so many times you can be asked whether you'd like a cup of tea/mind getting up and dealing with the kids/take the rubbish out or wash the pots while smiling beatifically and waving your arm in time to the music before someone comes and lifts up one of the lovely, closed-back, soft leather ear-pads and shouts the question in your ear. Of course, it's the audio quality that clinches the deal. There are any number of technical developments and innovations that escape my ears (and believe me, they are discerning). But the High-Res output from the NWZ-A15 Walkman® and the superb reproduction of the MDR-1A headphones is a winning combination. Every dad should have one. Especially if staying in a caravan.